. Published on April 24, 2015 . What’s New in Version 2015.4? The essence of Coach.me is to reimagine productivity by placing a coach with you at all times. This release takes two enormous steps in that direction. We’ve placed the best features of Coach.me onto the Apple Watch. We’ve upgraded Coach.me so that you never lose a chance to record your progress. If you’re offline, we’ll save every record of your progress until you’re back online. In other words, we’ve added one of our most requested features: offline check-in. Get Coach.me in the App Store Now! Coaching provides steroids for your productivity. It’s an opportunity for you to augment your motivation and expertise. Coaching is almost illicit in it’s power. And it’s the top performers in the world, people who will do anything to achieve their goals, who are most likely to work with a coach. Steve Jobs had a coach. The Williams sisters, Tiger Woods and Mozart had great coaching from birth: their father. Tom Brady has a team of coaches provided by the Patriots and then another team of coaches he hired on his own to watch over his diet, recovery, flexibility, strength, and psychology. In coaching, more is better. Originally, coaching was something you did in person, once per week. Then we built the first version of Coach.me for the web. This was coaching for when you’re at your desk. We built the second version of Coach.me for your phone. This is coaching that was always with you, but not always visible. Today’s version of Coach.me achieves something that’s never been done before: a coach, that’s always on, always available, always visible. This release is the most coaching, and therefore the biggest augmentation of productivity, that’s ever been available. We’ve realized a dream today and I want to walk you through how Coach.me works on the new Apple Watch. The first place you’ll see your goals are on the Glance feature of Apple Watch. This lets you see “at-a-glance” what your next goal for the day is. We’ve left all of the managing of your goals for the Coach.me iPhone app. That’s where you can go to order your goals in the order you want to do them each day. Once you’ve created a roadmap for your day, we’ll use Glances to always show you your next action. You’ll check in to that goal and then the Glance will update to show you the goal after that one. One more thing, we’ve added “Not today” to the Apple Watch version of Coach.me. Just long press on the check-in screen. In habit design we sometimes talk about triggering and anchoring. Triggering is about making sure you never forget. Anchoring is about making a goal automatic. Imagine a reminder to Set Priorities comes in at 8:35am, just as you’ve sat down at your desk. This triggers you to stop browsing emails and take action. Eventually this action becomes a habit, automatically anchored to your Coach.me reminder. This triggering and prompting works the exact same way with a coach, with the added benefit of getting personalized instructions. These notifications are incredibly powerful pieces of your productivity gains. And now they’re even more powerful. Messages from your coach and reminders will both show up on the Apple Watch. This means you’ll see them immediately without having to dig into your pocket. The really cool part is that we’ve added the ability to record your progress directly from the notification. You don’t need to open the app at all. On the iPhone, you swipe left on a notification to bring up a check-in button. On the watch, you’ll see a check-in button as part of the notification. 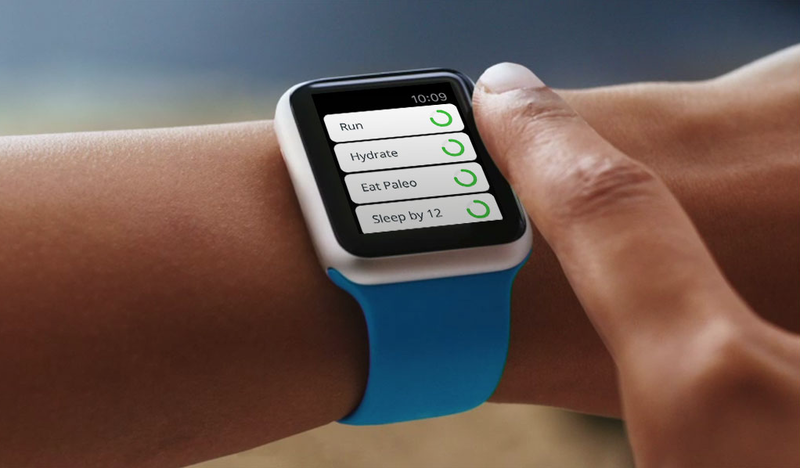 Last, you’ll be able to use the entire Coach.me app directly on the AppleWatch. That means you’ll be able to see all of your goals. If your goals have instructions, for a workout, you’ll see those instructions as well. You’ll also be able to check in to your goal and celebrate your progress, all from your wrist.